Sports-related injuries are the leading cause of tooth loss for patients under the age of 25, so it's important to Tappan pediatric dentist, Dr. Darren Tong and the entire Smile More Kidz team that your child's smile is protected during all athletic practices and competitions. 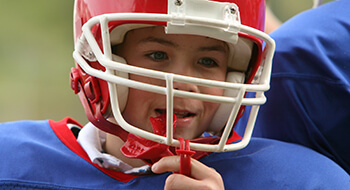 If your child engages in any athletic events where their smile may be at risk for injury caused by impact with other players, hard surfaces, or sports equipment, you should make sure they always wear a mouthguard to protect their smiles. Call our team to find out more about sportsguards or schedule an appointment. There are a variety of over the counter mouthguards available from your local sporting goods store. Boil and bite guards are the most popular solutions because they can be most closely molded to your child's smile. 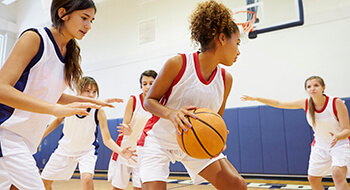 These guards provide adequate protection, but many kids find it difficult to adjust to wearing these guards because they are bulky, making kids less likely to wear their sports guards consistently. If you're looking for the most comfortable solution for your child, our custom sportsguards offer optimal comfort and protection. They fit snugly against the teeth to prevent discomfort or gagging. 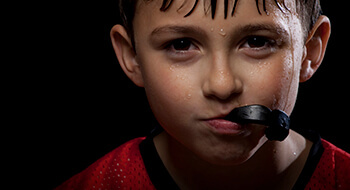 Due to the increased comfort, your child will also be more likely to wear their mouthguard consistently.